Profound3D.com is a new site from Media Supply, Inc., designed to support 3D products in the educational marketplace, featuring 3D printing technology from Zortrax, MakerBot, Afinia, 3D Systems and Robo3D. The printers offered on Profound3D will work consistently, generate functional 3D prints, and won’t become dust collectors. Media Supply, Inc., a leading supplier of data duplication equipment, specialized printers and blank data media, announced the launch of its new website focused on 3D printing solutions, Profound3D.com. The new website is a combination of a clean e-commerce site, featuring the highest quality products in 3D printing, and product information focused on 3D print technology in education. Through high-level customer support, premium products and fast order processing, Media Supply has become an established leader in the data distribution industry, and now the same support team is behind this new 3D printer specific site. 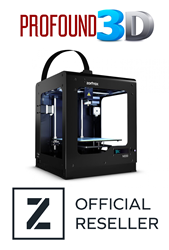 Profound3D.com is now a US Distributor for Zortrax 3D printers and supplies. Zortrax printers are one of the highest quality desktop 3D printers available, and have received multiple awards based on customer reviews for their ease of use and rock solid automation. The Profound3D blog, a key portion of the site, was developed for educators. It brings visitors the latest updates in software, equipment and curriculum packages being developed for the 3D printer makerspace. Profound3D.com also features customized 3D printer bundles designed for educators. These bundles offer educators a special discount on combinations of 3D printers, 3D printing filament and toolkits, brought together to make first time 3D printing simpler. Coming soon to the site will be curriculum packages based on grade specific groups, so educators can get a head start on projects and ideas for introducing 3D printing to the classroom. Media Supply, Inc. is approaching its 30th year of providing duplication equipment and specialty printing products, designed to meet the requirements of those wishing to distribute products and information in data, audio or video form. The company's key products and services are premium blank media, custom USB flash drives, 3D printers, USB duplicators and duplication supplies. Media Supply is headquartered in Exton, Pennsylvania. For more information, visit their website at http://www.mediasupply.com or call 1.800.944.4237.